Supernova remnants have long been suspected as the source of comic rays; they seem to be the only sources capable of supplying the energy required to feed the bulk of the cosmic rays in the Galaxy, and the mechanism of particle acceleration in the expanding supernova remnant shocks is thought to be well understood theoretically. However, unequivocal evidence for the production of high-energy particles in supernova shells has proven remarkably hard to find. Cosmic rays are deflected in Galactic magnetic fields and do not point back to their sources. High-energy gamma rays generated in interactions of accelerated cosmic rays with targets in or near the acceleration site are to best - and so far only - means to image cosmic accelerators. 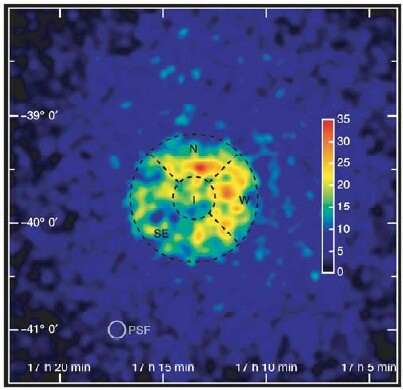 Yet, while high-energy gamma rays have been observed from a few supernova remnants, none of the observations was able to resolve the suspected the shell-type topology seen in radio waves or X-ray observations. The southern supernova remnant RX J1713.7-3946 (also known as G347.3-0.5) - discovered by ROSAT in the X-rays and later claimed as source of high-energy gamma rays and as a cosmic-ray acceleration site by the CANGAROO group - was a prime target for observations with H.E.S.S. Results presented here are based on 26 h of observations between May and August 2003, during the commissioning phase of H.E.S.S., and use two of the final four Cherenkov telescopes. With these data, due to the superior sensitivity and angular resolution of the instrument, for the first time the morphology of a TeV gamma-ray source could be resolved (Fig. 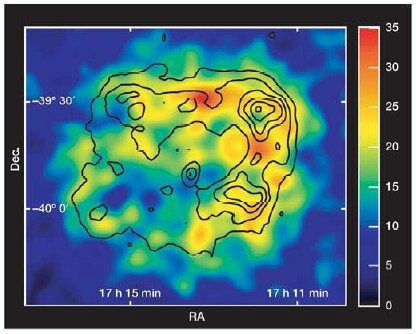 1): already in the raw count map of gamma-ray candidates, the supernova remnant stands out from the residual cosmic-ray background with a significance of 20 standard deviations. The overall shell structure is clearly visible and coincides closely with that seen in X-rays (Fig. 2). The overall gamma-ray flux corresponds to about 2/3 of the flux of the Crab Nebula as measured with H.E.S.S. The energy spectrum is shown in Fig. 3; it is well described by a power law with a photon index of 2.2, consistent with predictions of shock-wave acceleration models. The H.E.S.S. observations demonstrate clearly that high-energy particles are accelerated in the expanding shell of the remnant, and that essentially all regions of the shell contribute to some degree. 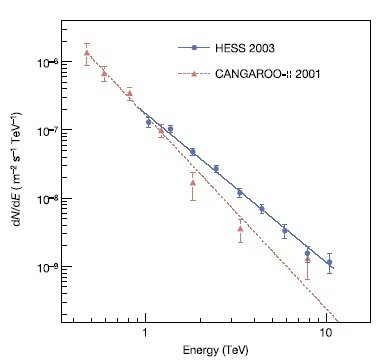 The extension of the gamma ray spectrum up to 10 TeV requires an accelerator capable of producing primary charged particles with significantly higher energies, up to 100 TeV. Based on the H.E.S.S. data from these initial observations, one cannot unambiguously identify the nature of the primary accelerated particles. Without doubt, there will be a contribution to the gamma rays through inverse-Compton scattering of high-energy electrons, which also generate the nonthermal X-ray synchrotron radiation. Another contribution is expected to come from accelerated protons interacting with ambient gas, in particular in the northwestern part of the remnant, where CO data suggest that the shell overtakes a nearby dense molecular cloud. Although disentangling the relative contributions of the various processes is difficult, it should be possible through spatially resolved multi-wavelength studies, which will be undertaken with the full H.E.S.S. array. Fig. 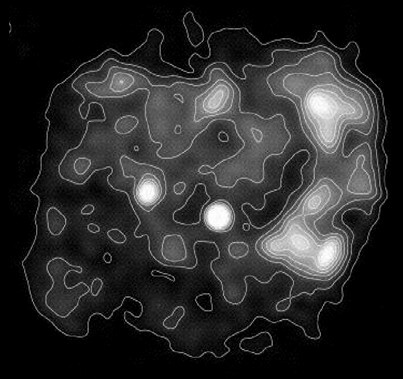 1: TeV gamma-ray count map of the wide field around RX J1713.7-3946. The point spread function of the instrument is indicated in the lower left corner of the image. For this data set, the energy threshold is about 800 GeV. Fig. 2: TeV gamma-ray image of .RX J1713.7-3946 obtained with the H.E.S.S. telescopes. No background subtraction has been applied. The superimposed contours show the X-ray surface brightness as seen by ASCA in the 1-3 keV range. Fig. 3: Gamma-ray energy spectrum as measured with H.E.S.S. for the full supernova remnant. The spectrum follows a power law with index 2.2. Also shown are CANGAROO II results for the northwestern part of the remnant.